Please pardon my premature use of Christmas lyrics in my subject line, but oh my, did winter hit hard this week! The mornings have been about zero degrees, with wind-chills in the negatives, and the highs in the teens. It’s pretty unusual for it to be this cold this early in winter, so hopefully this is just a temporary cold snap. I broke out my winter coat finally, and I feel like a new missionary all over again because that coat carries so many memories. It was 6 o’clock pm when we took this picture… it looks like midnight though! Last Monday basically all I did was say goodbye to people! Our zone got decimated over transfers. I was looking at our zone picture from when we went to the temple in September, and it’s only Sister Martin and me left! Crazy. We were able to meet all the new missionaries to the zone this week though, and it was kind of funny because my old Wyoming North zone is getting back together! Plus, Sister Jones (my old companion) is serving in my zone now, so I’m excited to get to see her more. Mary and Jessica are getting baptized this Saturday!! They had their baptism interviews this past Saturday, and they are all set to go and they are so excited. They’ve been working with various missionaries for over six months now, so this is a long time coming. While we were waiting during their baptism interviews, we got to talking to their mom, Pauline. She expressed a desire to quit smoking, so we talked to the elders about giving her a blessing. When they gave that blessing, the Spirit that filled that room was practically tangible. Afterwards, Pauline asked us if she could take the lessons!! We are excited to see them coming to the gospel as a family. The only problem we are running into with the baptism this Saturday is finding enough jumpsuits! The elders have 3 people also getting baptized in 4th ward, so we are having a combined service with 5 people being baptized. It should be awesome! Our investigator Karen came to church this past Sunday with her boyfriend! They both seemed to really enjoy it. We set up times to meet with them each separately this next week, so that ought to be good. Adriana S. is still progressing towards her baptism in December. She is going home for Thanksgiving, so we won’t get to see her for a little while, but thankfully her Dad is returning to activity in the church so she will probably get to go to church with him. We had a lesson this week with her and her boyfriend for the first time. Her boyfriend is a hoot! He’s from somewhere in northwest Africa, and has a great sense of humor. He is very open to religion, but has his own spiritual beliefs already. We got a twenty minute rundown about how animals are reincarnated sinful people, and when we eat meat we are eating their sins, so therefore we should all be vegan… oh the things you encounter on the mission. He also invited us to his Buddhist temple this Sunday, but unfortunately it conflicts with our ward’s meeting time. This week we did a lot of contacting referrals, and we saw a lot of success! 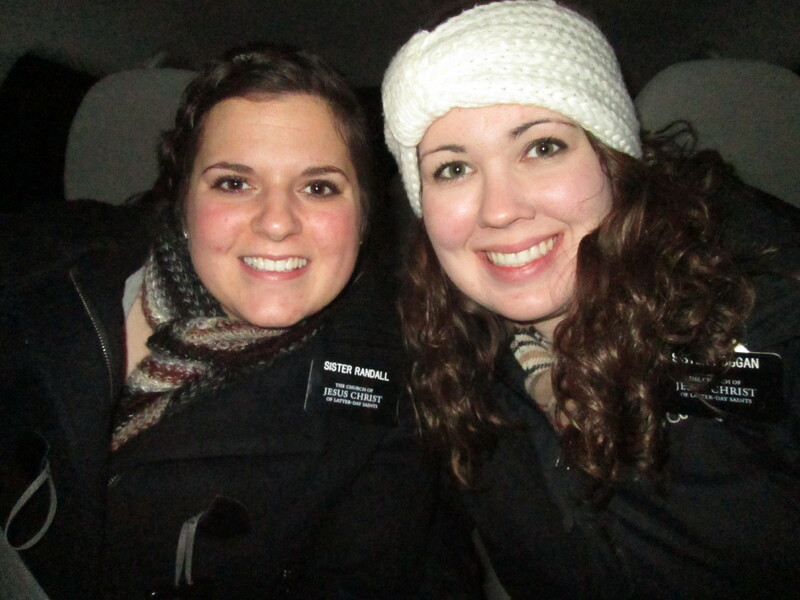 We found two new less-active girls in the YSA ward that are definitely ready to come back. I’ve found that with young single adults, it is primarily social reasons that keep them from church, which was the case with both of these girls. The funniest thing that happened this week was definitely our adventure last night. We were having a Book of Mormon study with one of our recent converts, Paula, and at the end she mentioned that she thought her computer ate one of her CDs. (She has one of those desktop computers where the whole computer is in the monitor, but it does have a pop-out disk drive.) We checked it for her, and at first glance it appeared totally empty. But when we grabbed our phone flashlight, we saw that the CD had gotten caught in a little metal gap right outside of the disk drive. (it’s hard to describe, so just run with it). Well, long story short, I end up on the ground with the flashlight on my mouth and two butter knives and tweezers in hand trying to pry it out! 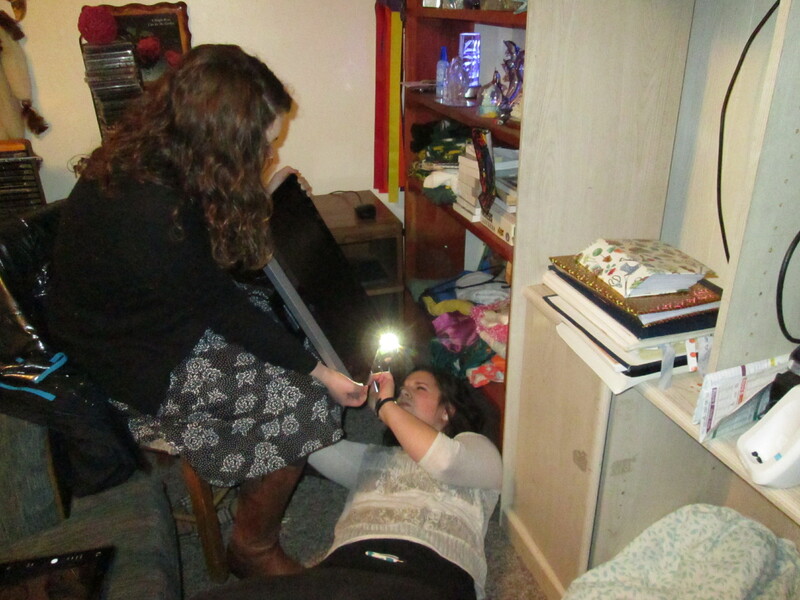 Sister Randall tried for like ten minutes too. Alas, it was to no avail because we couldn’t get it, but it sure was an adventure! Sister Randall’s turn to try and get the CD out! Tomorrow we are having a special zone training/leadership-council/mini-zone-conference thing with President Mecham, which I am really looking forward to! I am also very excited for the upcoming Christmas zone conference. Sister Mecham asked me to be the accompanist for the choir music we will be singing, which I’m pretty stoked about. 🙂 One of the songs is “Just Beyond the Manger”, composed by Joseph Martin. Look it up! It makes me cry every time. Stay safe and warm this week!! Love you all so much! !